Background: A six-week rural interprofessional health professions summer preceptorship provided an interprofessional training experience (IPE) for upper level baccalaureate and post-baccalaureate/graduate level health professions students in Dixon, Illinois, USA. There are three distinct yet complementary components of this forty hours per week summer preceptorship: Numerous interprofessional clinical shadowing experiences, a community service-learning project carried out as a team and weekly classroom sessions. This study assesses knowledge and attitude changes about IPE among students who participated in this Rural Interprofessional Health Professions Summer Preceptorship between 2006 and 2011. Methods: Fifty-two students over the six program years were asked to complete an identical pre-/post-questionnaire. The questionnaire included scales on seven topics, two of which addressed knowledge and attitudes about IPE: (i) Understanding of their own and other professions' work roles and (ii) Perceived ability to work effectively in interprofessional teams and make use of skills of other professions. Fifty of the fifty two (96.1%) students completed both the pre- and post-tests. Results: Positive changes from the pre- to the post-tests were observed for the scales that related to interaction with other professions and assessment of their professional skills and students' understanding of the roles of other professions. Pre- versus post-preceptorship students also reported greater experience working as a member of an interprofessional team and an increase in their support for interprofessional education within a rural setting being required for all health professions students. Conclusion: A rural interprofessional health professions summer preceptorship that includes preceptor shadowing, a community service-learning project and classroom work proved to be an effective approach to developing interprofessional health care teams, increasing the knowledge and skills of participating students and creating positive attitudes toward interactions with other professions. A recent rigorous Cochrane review of 15 studies assessed the evidence for the effectiveness of interprofessional education. All 15 studies compared outcomes following an interprofessional training experience (IPE) intervention to outcomes in either similar clinical settings that did not receive the IPE intervention, or in the same clinical setting before the intervention was made. Seven studies reported positive outcomes for healthcare processes, patient outcomes, or both; four studies reported mixed outcomes (positive and neutral); and four reported no effects of IPE. The review concludes that, "The small number of studies included in this review, and their varied nature, limit our understanding of the key components of IPE and its effectiveness." The review also indicated that more rigorous studies such as randomized trials of educational interventions are needed to allow conclusions to be reached about the effectiveness of IPE. With support from the Quentin N. Burdick Program for Rural Interprofessional Training  from the US Department of Health and Human Services, an IPE program was created that included involvement of the University of Illinois at Rockford. The purpose of the program was to "support the education and training of health professions students in rural, underserved communities and improve access to health care in rural areas." The Illinois Quentin N. Burdick Fellows Program sought to encourage the use of new and innovative methods to train health care practitioners; demonstrate and evaluate innovative interprofessional methods; enhance the amount of relevant research conducted concerning health care issues in rural areas; and make rural practice a more attractive career choice for health care practitioners. Following the federally funded Illinois Quentin N. Burdick Fellows Program, a Rural Interprofessional Health Professions Summer Preceptorship was created in rural Dixon, Illinois, funded by the Katherine Shaw Bethea (KSB) Hospital in Dixon in partnership with the National Center for Rural Health Professions (NCRHP) based at University of Illinois at Rockford. The NCRHP (www.ncrhp.uic.edu) was established in 2003 by the University of Illinois Board of Trustees on the campus of the University of Illinois at Rockford. Information about the Rural Interprofessional Health Professions Summer Preceptorships are under the "Other Opportunities" menu option (now in other locations also). The purpose of NCRHP is to meet the health care needs of rural Illinois residents through collaborative projects involving multiple health professions. NCRHP also aims to emphasize clinician recruitment and retention, and health care delivery initiatives that will positively impact the health of rural residents and their communities. Components of the Rural Interprofessional Health Professions Summer Preceptorship were derived from the Burdick Fellows Program's general guidance to funding recipients, the interests of the Rockford faculty and the curriculum of an existing rural educational program at the NCRHP. The Preceptorship's classroom sessions addressed topics of interest to future rural practitioners. A community project was included within the Summer Preceptorship because preceptorship faculty, familiar with problem-based learning (PBL), recognized the value of hands-on, active learning, centered on students' investigation and resolution of real-world problems. Shadowing rural practitioners as they completed daily clinical activities had been a successful part of the Rockford campus' Rural Medical Education (RMED) Program,  so shadowing became the third part of the curriculum of the interprofessional preceptorship. Incorporating ideas from these various sources, a six-week Rural Interprofessional Health Professions Summer Preceptorship was established for upper level baccalaureate and post-baccalaureate/graduate level health professions students in 2004 as a partnership between KSB Hospital in Dixon, Illinois and the University of Illinois NCHRP in Rockford. Students with an interest in rural health care from programs in medicine, physician assistants, nursing, pharmacy, public health and other disciplines apply to participate in the summer preceptorship. Program faculty from these various disciplines review applicants' prior rural background, resume and statement of interest, with learner diversity also considered. The summer preceptorship is based at the KSB Hospital (www.ksbhospital.com), an 80 bed rural, non-profit, community hospital. A key purpose of this six-week preceptorship is to provide an interprofessional rural training experience for health professions students to increase their understanding of interprofessional health care delivery within rural settings. At the end of the summer preceptorship, it is intended that students will be able to explain the roles and contributions of the represented health disciplines. Additionally, students will be able to recognize the advantages and challenges of an interprofessional approach to the delivery of health care. Students form an interprofessional team and work together in planning and developing a community service-learning project that addresses an identified health issue in the community. The program begins with a two-day orientation followed by an intensive five-week integrated curriculum. The interprofessional clinical shadowing component requires approximately 50% of the participants' time. The community service-learning component, in turn, requires approximately 40% of the participants' time, and the classroom/reflective component requires approximately 10% of participants' time. The preceptorship ends with a two-day summative reflection period that includes program evaluation, faculty evaluation, feedback and recommendations for future preceptorships. A stipend is awarded to each student. Meals and housing are also provided by KSB Hospital. Finally, students participate as camp counselors for a two-day high school health careers camp. The current paper assess whether the students participating in a six-week preceptorship with these three design components show evidence of change in knowledge and attitudes important to interprofessional practice as a health professional in a rural area. A pre-post design was used to assess changes in knowledge and attitudes related to several aspects of the preceptorship experience among the 52 students who completed the preceptorship from 2006 to 2011. Approval for the evaluation of the program was granted by the University of Illinois Rockford campus Institutional Review Board (IRB). Specific components examined and reported here relate to interprofessional interactions: (i) Students' understanding of their own and other professions' work roles and (ii) Students' perceived ability to work effectively in interprofessional teams and make use of the skills of other professions in their clinical work. Most questions used 5 or 7 point Likert response scales. The pre-program assessment was conducted at the beginning of a two-day preceptorship orientation, and the post-program assessment was conducted on the final day of the preceptorship. Fifty of the 52 students (96.1%) completed both pre- and post-session assessments. For analysis, questions on the pre- and post-program assessments were grouped into pre-selected groupings based on topics on which they were designed to address. These pre-selected groups of questions relating to interprofessional interactions were addressed through two scales: S1: Interaction with Other Professions and Assessment of Their Professional Skills and S2: Understanding the Role of Other Professions. The questions relating to these two scales are shown in the [Appendix] [Additional file 1]. Cronbach's alpha and factor analysis demonstrated the acceptable internal reliability of the two scales [Table 1]. Paired t-tests (confirmed by non-parametric Wilcoxon signed-ranked tests) were used to assess changes in students' responses to other questions between the beginning and end of the preceptorship. Findings from selected individual variables were also compared, pre- versus post-preceptorship. 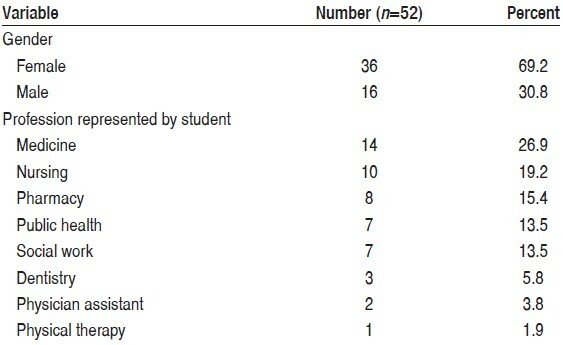 Characteristics of the 52 students participating in the interprofessional summer preceptorship over the six years are presented in [Table 2]. About 70% of the participating students were female. Twenty-seven percent of participating students were training in medicine and 19% were training in nursing, pharmacy, public health and social work students each constituted about 13-15% of all students, with a small number of students from several other health professions participating. Composite scale results are presented in [Table 3] for the two attributes relating to working as an interprofessional group. There was a significant shift from pre- to post-assessments toward stronger agreement on Scale 1 relating to interacting with other professions and students' assessment of their own professional skills. Scale 2, assessing perceived understanding of the role of other professions, also showed a significant increase in agreement with understanding the role of a variety of other health professionals. [Table 4] presents findings related to selected additional individual questions that assessed changes in attitude toward specific aspects of the interprofessional experience. On a 1 to 5 Likert scale, significant positive changes from before to after the preceptorship were found in students' agreement that (i) they have experienced working as a member of an interprofessional team (2.08 versus 3.69, P < 0.01) and (ii) interprofessional education should be required for all health professionals (4.33 versus 4.59, P < 0.01). Interprofessional training is important to improving quality in health care and patient safety. In this context, the results of this pre-/post-assessment of the Dixon Interprofessional Summer Preceptorship show improvement in students' knowledge, skills and perceptions regarding team functioning and team problem-solving. Although extensive marketing is conducted to all graduate-level health professions students in Illinois, most students applying and participating are women. Medicine and nursing are the professions most commonly represented among the summer preceptorship's students, in part due to the Illinois RMED program being based at the NCRHP in Rockford, where students of the local RMED program and nursing college campus are predominantly women. A community college's nurse training program affiliated with KSB Hospital regularly recommends registered nursing students. University of Illinois College of Nursing nurse practitioner students also regularly participate, which also contributes to a higher representation of the nursing profession. Overall, participating students reported an increase in experience and in the perceived importance of interprofessional training. These changes in perspective were among the preceptorship's goals for students. The composite scale scores generally showed changes in the expected direction related to interaction with other professions and assessment of their professional skills, and knowledge of other professions. Shadowing the work of community health professionals outside their own profession expanded students' understanding of other professionals' roles in health care. The typical approach used to train health professions students within universities in the United States does not provide substantial opportunities for students to interact with students from other health professions. The three components included within the design of this summer interprofessional preceptorship deliberately seek to create the changes in knowledge and attitudes that were found among students participating in this evaluation. The formal orientation and other preceptorship activities aim to provide opportunities for interactions between students of various disciplines around rural topics and the roles of several health professionals. In the summer preceptorship, students interact with working health professionals from other disciplines to learn first-hand about their job role(s) and functions. Students also observe and discuss work activities with other professions. The one-on-one interactions between community health professionals and the students leads to a clear understanding of the skills and functions of various health professionals, including a better understanding of each student's chosen profession. The classroom and project aspects of the preceptorship are intended to engage students in real world issues. The community service learning project is selected with input from the host community with the purpose of having students work as a team on an issue that will improve the health of residents of the community. Limitations of the current assessment include the rather small number of students who have completed the preceptorship. As expected in a new, real-world program there have been changes in the staff and preceptorship curriculum over time that may have affected study outcomes. Further, the questions used in the pre-/post-assessment tool have face validity and were shown from the analysis presented here to have internal reliability; however, the questions and corresponding scales have not been externally validated. Lastly, this evaluation found meaningful changes in students' attitudes and self-efficacy when measured immediately before and after the preceptorship, but an assessment of longer term outcomes is needed to fully examine its impact with learners. The importance of interprofessional education and its relationship to quality health care delivery are increasingly recognized. IPE is particularly important for rural communities, where the availability of healthcare providers may be limited, and effective teamwork among those present more essential. This evaluation of a summer interprofessional preceptorship demonstrates short-term improvement in students' attitudes and sense of self-efficacy in working with other professions. A summer preceptorship that involves preceptor shadowing, a community service-learning project and classroom work addressing IPE is shown here to be an effective approach to support interprofessional health care development. The on-going support of KSB Hospital and other community partners in Dixon, IL related to the interprofessional summer preceptorship is appreciated. Thanks also to Dana Evans, MS of the NCRHP staff and Eric Junco of the College of Pharmacy in Rockford for their assistance related to preparing this article and also Michael Glasser, PhD, for his review of earlier versions of the manuscript. Institute of Medicine. Crossing the Quality Chasm: A New Health System for the 21 st Century. Washington, DC: National Academy Press; 2001. Institute of Medicine. Health Professions Education: A Bridge to Quality. Washington, DC: National Academy Press; 2003. Hall LW, Moore SM, Barnsteiner JH. Quality and nursing: Moving from a concept to a core competency. Urologic Nursing 2008;28:417-25. Cronenwett L, Sherwood G, Barnsteiner J, Disch J, Johnson J, Mitchell P, et al. Quality and safety education for nurses. Nurs Outlook 2007;55:122-31. Cronenwett L, Sherwood G, Pohl J, Barnsteiner J, Moore S, Sullivan DT, et al. Quality and safety education for advanced nursing practice. Nurs Outlook 2009;57:338-48. Accreditation Council for Graduate Medical Education (ACGME). Common Program Requirements. Chicago, 2011. Available from: http://www.acgme.org/acgmeweb/Portals/0/PFAssets/ProgramRequirements/CPRs2013.pdf. [Last accessed on 2013 Oct 07]. American Dental Education Association. Competencies for the new general dentist. J Dent Educ 2008;72:823-6. Association of Schools of Public Health (ASPH). (2011). Undergraduate Public Health Learning Outcomes Model Version 1.0. Available from: http://www.asph.org/userfiles/UGPHLearningOutcomes_ModelVersion1.0_2011_03_09.pdf. [Last accessed on 2013 Oct 07]. Buring S, Bhushan A, Broeseker A, Conway S, Duncan-Hewitt, W, Hansen L, et al. Interprofessional education: Definitions, student competencies, and guidelines for implementation. Am J Pharm Educ 2009;73;1-8. Accreditation Council for Pharmacy Education. 2011. Accreditation Standards and Guidelines for the Professional Program in Pharmacy Leading to the Doctor of Pharmacy Degree. Available from: http://www.acpe-accredit.org/pdf/S2007Guidelines2.0_ChangesIdentifiedInRed.pdf. [Last accessed on 2014 Sep 2]. Reeves S, Perrier L, Goldman J, Freeth D, Zwarenstein M. Interprofessional education: Effects on professional practice and healthcare outcomes (update). Cochrane Database of Systematic Reviews 2013;3:CD002213. The Quinton N. Burdick Program. US Department of Health and Human Services. Available from: http://quentin-n-burdick-program-for-rural-interdisciplinary-training.idilogic.aidpage.com/12-17-2004.htm [ Last accessed on 2013 Oct 07]. Hmelo-Silver C. Problem-Based Learning: What and How Do Students Learn? Educ Psychol Rev 2004;16:235-66. Glasser M, Hunsaker M, Sweet K, MacDowell M, Meurer M. A Comprehensive Medical Education Program Response to Rural Primary Care Needs. Acad Med 2008;83:952-61.